On a beautiful sunny day we board a boat at the harbor of Akaroa, the oldest colonial town on New Zealand’s South Island, for our nature cruise along the coast. Akaroa mean “long harbor,” which it certainly is. We ride for more than an hour without ever getting out in open water. The catamaran zips along at a high speed, but the sun keeps weather pleasant despite the wind. We slow down to view Onuku Maoir marae, a sacred place officially opened in 1990 during the Centenary celebrations, where the 1840 Treaty of Waitangi. 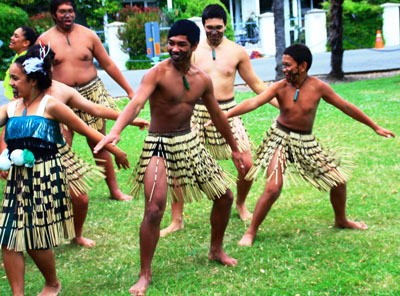 This treaty established British law while guaranteeing Maori authority over their homeland and culture. The “meeting place” is an important facility for Maori society and significant in New Zealand history. Black and gray hector dolphins, including some babies, surfaced from time to time. 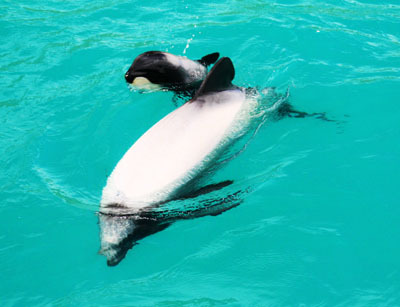 Females mature in 8 years, are pregnant for a year, and only have 3-4 calves intheir lifetime. They don’t have great eyesight but make up for that with a keen sense of eco-location. The dolphins are protected in a 40 mile radius, and part of our cruise fee goes to the Department of Conservation to preserve wildlife. 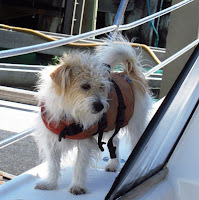 Murphy, the dolphin dog on this cruise, has an acute sense for finding dolphins. He scurries excitedly from one side of the boat and one end to the other as he determines where they are in the water—so cute and fun to watch—and he’s always right! At Cathedral Cave we see birds nesting high up the rock walls. Green rolling hills in and turquoise water provide a real fest for the eyes, as we watch kayakers glide close to shore. 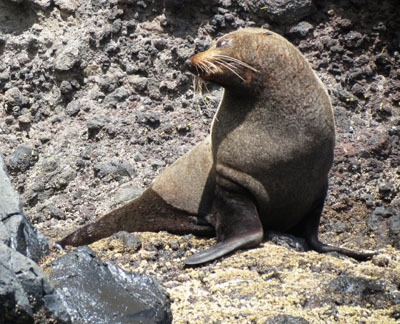 A colony of about 15 fur seals, including pups, sits on rocks soaking in the sunshine. We watch them waddle around and slide into the water. Because it's a clear day we see many sea birds in nests and flying overhead. We learn about French, British, and Maori history. In 1838 the French whaling captain Jean Francois L’Anglois wanted to establish a settlement, but British officials hurried to assert their sovereignty and staked a claim 4 days before L’Anglois returned with French colonists. Immigrants from France and Germany followed, and these first settlers give Akaroa much of its Gallic character and picturesque architecture. 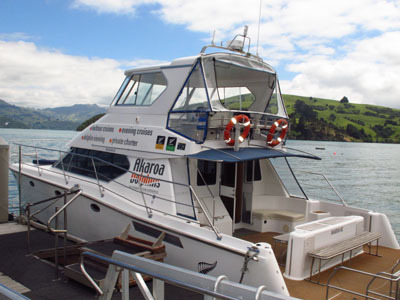 The captain of our boat is the sixth generation of his family in Akaroa, which became a township in 1840. 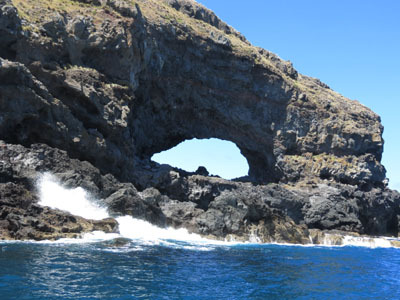 Akaroa has only 500 permanent residents, but warm summer days can bring in three to four thousand visitors.